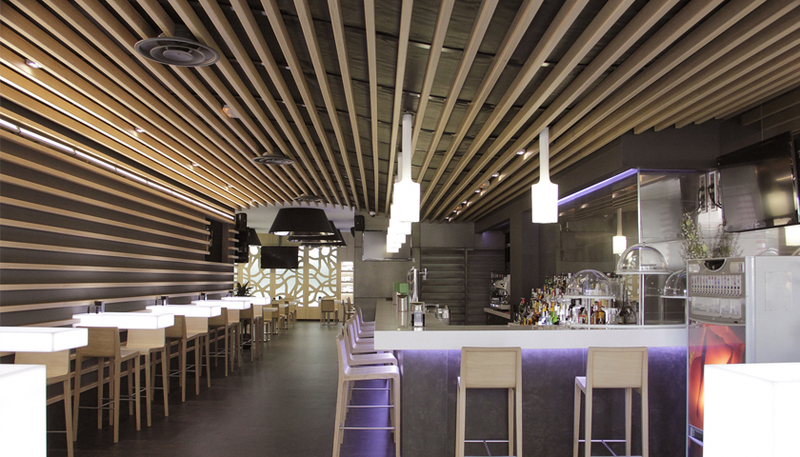 HI-MACS® lights up the New Cervecería Islia Bar with solid surface materials .. Tables, sinks, bottle rack, umbrella stand, and logo signage. HI-MACS® is a solid surface material that can be moulded into any shape. It is widely used for architectural and interior applications, such as sculptural and high performance wall-cladding or kitchen, bathroom and furniture surfaces, in commercial, residential and public space projects. It is composed of minerals, acrylic and natural pigments that come together to provide a smooth, non-porous and visually seamless surface which meets the highest standards for aesthetics, fabrication, functionality and hygiene – offering manifold advantages over conventional materials. At the forefront of innovation as always, LG Hausys recently introduced two new products. First HI-MACS Structura®, a 3D textured panel material that takes solid surface opportunities to a new level. And now HI-MACS® Ultra-Thermoforming, an innovative formula that pushes the boundaries of solid surface shaping to a whole new level, with 30% more thermoplastic capabilities – the biggest innovation for the Solid Surface history since its inception in 1967. LG Hausys’ HI-MACS® uses a simple heating process to give three-dimensional thermoplastic forming capabilities, allows visually seamless designs, offers a virtually limitless range of colours and – for some shades – exhibits a special translucency when exposed to light. Although HI-MACS® is almost as robust as stone, it can be worked in a similar way as wood: it can be sawn, routed, drilled or sanded. Countless internationally recognized certificates attest to the quality of HI-MACS® in terms of ecological commitment, hygiene and fire resistance – being the first Solid Surface in the market to receive the official European Technical Approval (ETA) for façades – for Alpine White S728 colour. To find out more about solid surface materials by HI-MACS, please click here.